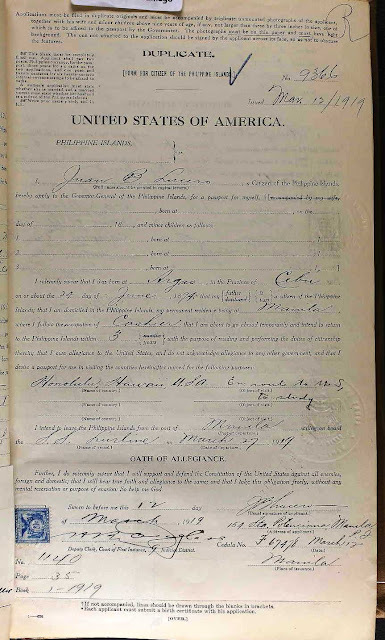 Although sources such as Immigration, Passengers List, and Census records don't always appeal to the regular amateur Filipino genealogist, if one has relatives who have migrated to the United States or anywhere else in the last hundred years or so then these records come in very handy. These especially become very meaningful to the Sakada families in Hawaiian sugar and pineapple plantations and whether your family and relatives stayed in Hawaii for good or returned to the Philippines these records help reconstruct the earlier years of these Filipino immigrants. As always, it is the intention of this blog to share some tips in using these other not so common but still useful genealogical sources. While it may not always yield more information that will expand your family tree. it can add more information about certain individuals in your family which eventually will allow you to understand these people better. Since I began tracing my mom's family since 1994 I have already traced all possible ancestors that I could find. While I have found some new names here and there in recent years, all I have been doing so far with regard to my maternal genealogy is simply fine tuning the history and adding more source materials to it when I could to make it more credible and verifiable. But there remains the usual difficult to prove legends and tall tales that have been passed on even in the more modern years. In his last letter to his family in Argao, Cebu, Juan Lucero, son of Don Anacleto V. Lucero and a second cousin of my great-grandfather, informed his family of two things. First, that he had already gotten married to a European woman and that they were having their honeymoon in Europe. The second thing of which he informed his family was that soon he and his wife would go to America aboard a new ship that had caused quite a lot of talk and stir in England. The ship, the Titanic, was to make its maiden voyage from England to America. No other letter was received from Juan after this. This is, at least, what the Gumila family says. It is common knowledge that the Titanic sank and if indeed Juan Lucero had pushed through with his plans then he and his wife sank along with many of the ship’s passengers. 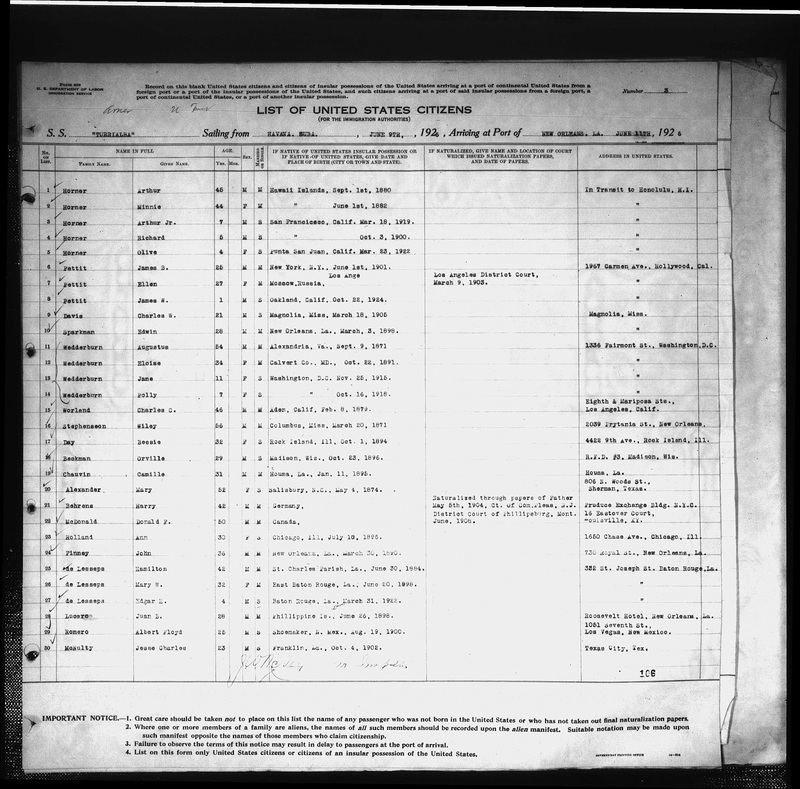 However, a quick search in any of the websites that have a comprehensive and detailed information on the Titanic revealed that no one by the name of Juan Lucero was listed in any of the first, second or third class passengers’ list, nor was there a Juan Lucero in the other headings, like crew, musicians, etc. Perhaps he and his wife never boarded the ship. Perhaps some last minute change of mind caused them to reschedule their trip to America. Whatever happened to Juan and his wife, no one knows today. Perhaps they registered under different names, or were never registered at all (illegal aliens?). Still, the story is one of those stories that add color and mystery to our family history. For years I have considered this story as a romantic tale that would forever be just that - a tale. Recently, with the availability of many records online and especially through the diversity of records made available for free by the Church of Jesus Christ of Latter-Day Saints (LDS) I have finally been able to find out just what exactly happened to this second cousin of my great-grandfather. 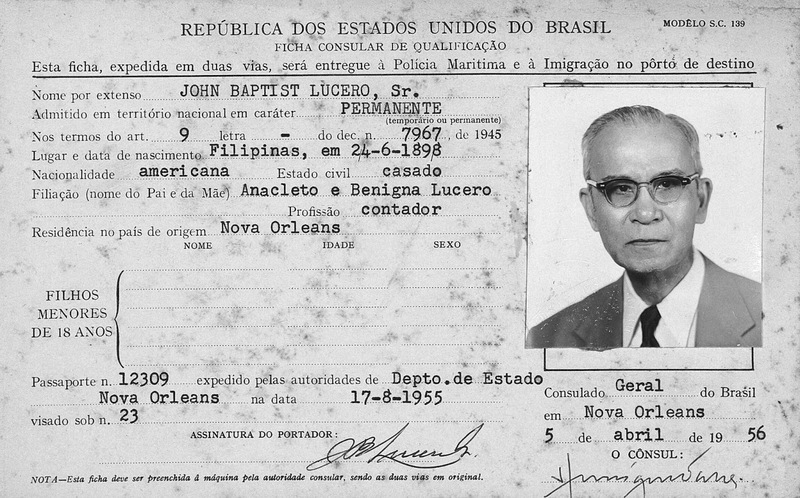 Such a simple document, but Juan B. Lucero's immigration paper in Brazil gave me the first clues needed to 1) trace his whereabouts before setting foot in Brazil in 1956 and, 2) confirm him as the missing branch in the Lucero family tree. 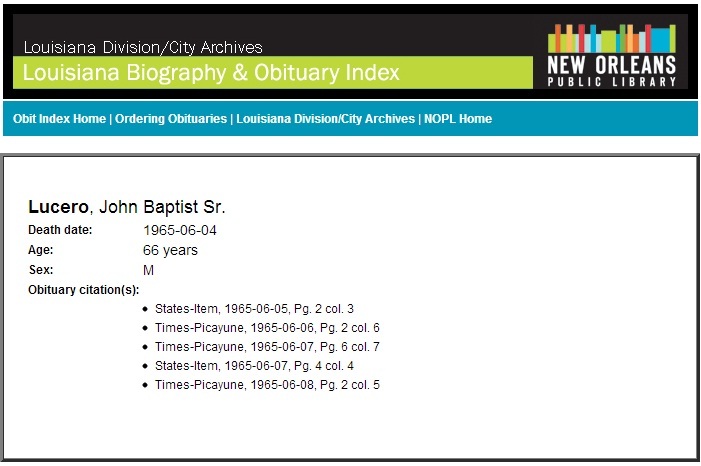 The record above listed his place of origin as Nova Orleans, which obviously is New Orleans in Louisiana. It is interesting to point out that he went from one place where the Mardi Gras was a big event to another place where the Mardi Gras was an even bigger festival. Perhaps he just liked the festivities? Anyway, the second concern I had was also answered immediately as the document listed Anacleto and Benigna Lucero as his parents. There was no longer a doubt that this accidental discovery of mine was my relative. We begin with Juan Lucero's birth in Argao, Cebu, on June 24, 1894. He was the second child of Don Anacleto Lucero and Dona Benigna Villareal. He was named after the saint whose feast was celebrated on the day of his birth. In this case, it was St. John the Baptist. But he was the third Juan Lucero, the second being his grandfather, Don Juan Lucero Cabrera, and the first being Don Juan's uncle, Juan Lucero de Sta. Cruz. Based on the records available, it would appear that he left Argao in his early twenties and went to Manila and worked there as a cashier until about 1919 when he was 25 years old. Then in March of that same year he applied for a US passport and indicated "to study" as his reason for wanting to go to the United States. And although he indicated in the form that he would return to the Philippines after three years this appears not to have happened. Based on his letter to his family back in Cebu it is highly possible that he first set foot in Cuba after some time in the United States. Surely, he meant to make the location where he met and eventually married his wife more romantic, that is why he ended up embellishing his letters and claimed that he had married a European and that they were about to sail with the Titatinc. 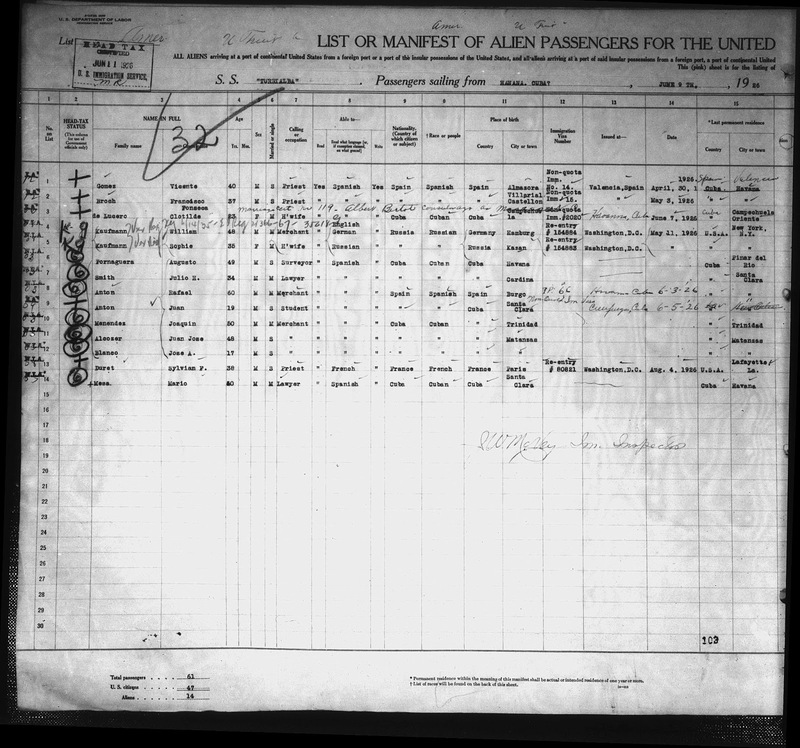 What we know from existing passengers' manifests is that on June 9, 1926 Juan Lucero was listed as a passenger of the S.S. Turrialba which sailed from Havana, Cuba and arrived in New Orleans on the 11th. In a different page listed as alien passengers we also see Juan's new wife, Clotilde de Lucero. We can assume they most probably just got married because the immigrant visa given to Clotilde was issued just 2 days before the ship sailed for New Orleans. Here, at last, we see the wife that Juan Lucero wrote about in his letters. She wasn't European, but a Hispanic woman born in the town of Campechuela Oriente in Cuba. They were also most probably married in Cuba, though the record for this has evaded me for now. We can surmise from the address given by Juan that they were really new to New Orleans since they listed Roosevelt Hotel in New Orleans as their residence. 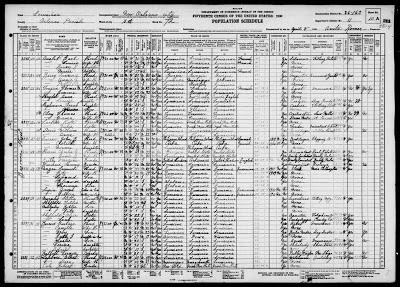 The next reference we have of Juan and his wife Clotilde is the 1930 Federal census where the couple is listed as still living in New Orleans but now has an additional member in the person of their new daughter, Norma, born just that year. We know by this time that Juan was already slowly adapting to the American way of life because this is the first time that he is listed as John B. Lucero. We know that in 1930 he and his family were renting a $35/month apartment in the city and, true to the job he held before he left the Philippines he worked as a bookkeeper, this time in a shipping company. We also know that he had no problems communicating with his Cuban wife because he listed Spanish as his original mother tongue. Six years later we see the family aboard the S.S. Seatrain New York sailing from Cuba to the United States again. This time there were 4 members, as a boy, John B. Lucero, Jr., was added to the family in 1934. 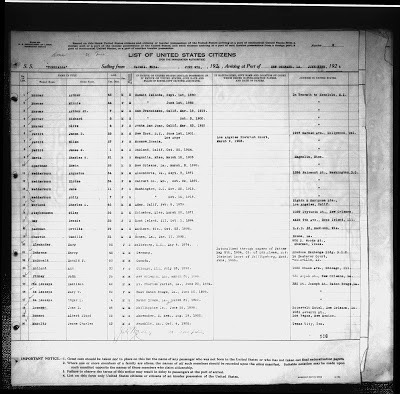 A separate piece of passengers' manifest shows an additional information about Juan Lucero - he had been naturalized as an American at the Federal Court of New Orleans in 1932. 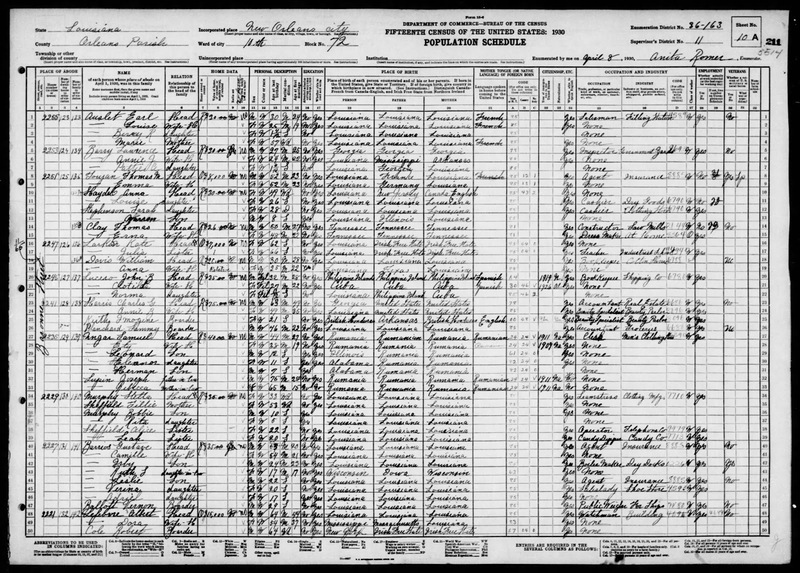 In 1940 the family of 4 is once again listed in the federal census. Once again Juan is no longer Juan but John Lucero. Clotilde is now listed as Clotille. In a 1945 registration card we see the complete address of the Lucero family - 3829 Ge. Taylor Street, New Orleans City. In this same card we see that Juan still considered Argao as his hometown as he listed Argao, Cebu as his birth place, instead of putting the usual Philippine Islands. A summary of obituary references to John B. Lucero, Sr. 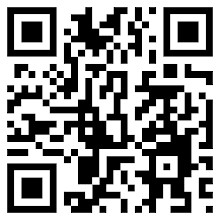 Sadly, we can't access the original obits for now. One of the last records that mentioned Juan Lucero is an immigration card in Brazil. In a 1956 record, the one seen earlier in this narrative, we see that John Baptist Lucero has been given a "permanent" admission to Brazil. The final record we have of him mentions his death at the age of 66 on June 4, 1965. Whatever his reason for migrating to Brazil, we do not know. But we do know that he returned to the United States sometime between 1956 and 1965 because his final resting place was in New Orleans. I had tears in my eyes when I finished documenting his life story. 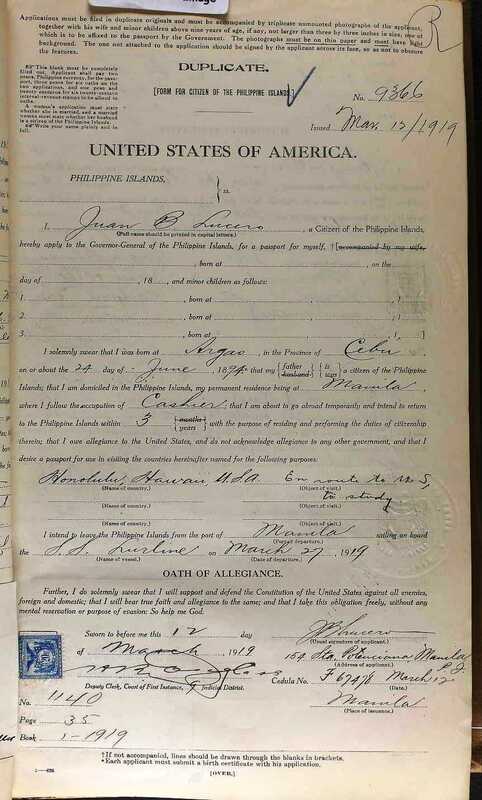 Juan Lucero, my great-grandfather's cousin, left Argao, Cebu, in 1919 and never returned to him hometown. For years his family felt contented with the amazing stories he told them through his letters. And for years these tales got passed on from generation to generation. I'm pretty sure Juan Lucero lived an amazing life, even without the Titanic or him marrying a European. I felt I had traveled with him, from Argao to Manila, to the United States to Cuba, then back to the United States, then to Brazil, and finally back to the States. 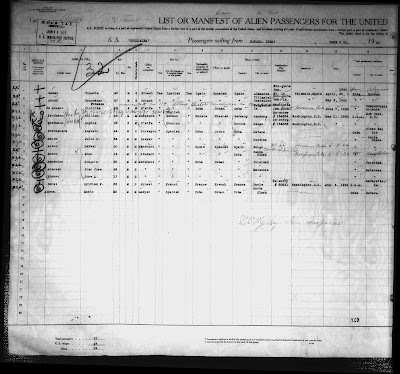 His story has now been completed thanks to the few census, passengers' list, immigration, registration cards, and obituary records from various sources online. Now that I think about it, I take back what I said. These other records are as crucial and essential as the common vital and church records.